In the portion, BeShalach (When Pharaoh Sent), Pharaoh sends the children of Israel from Egypt following the ten plagues that he and the Egyptians suffered. The Creator does not lead the children of Israel directly to the land of Israel because it means they will have to go through the land of the Philistines and the Creator does not want the children of Israel to fear war and escape back to Egypt. Instead, He sends them through the desert. Moses takes Joseph’s bones. The Creator walks before the people, lighting the way for them with a pillar of cloud—during the day, and a pillar of fire during the night. When Pharaoh learns that the children of Israel really did escape from Egypt he changes his mind and decides to chase them. He assembles 600 chosen chariots that chase the children of Israel all the way to the Red Sea. The children of Israel find themselves with the sea before them and Pharaoh behind them. This is when the first miracle takes place: Moses strikes the sea, it is cut in two, and the children of Israel pass through dry land. When the Egyptians try to pass, the water closes on them and they all drown. In gratitude to the Creator for the miracle, the children of Israel sing the Song of the Sea (Exodus, 15). Moses leads the children of Israel through the desert on the road to Shur. When the people grow thirsty they arrive at Marah, a place where the water is bitter so they cannot drink. 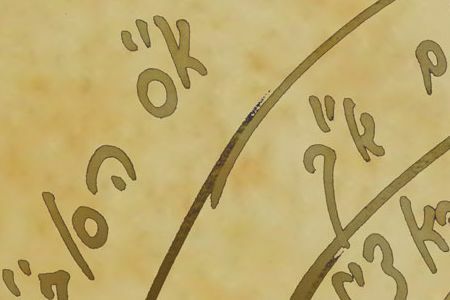 Here another miracle occurs and the water becomes fresh (the Torah writes “sweet”). Moses and the people continue to advance toward Eilam where they discover twelve springs of water and seventy dates. They park there then continue toward the desert of Sin. The people complain that they have run out of supplies and the Creator performs two miracles: in the first, manna comes down from the sky. In the second, quails came over the camp of Israel so they will have meat in the evening. The children of Israel receive the first commandment—to observe the Sabbath. They are told that on Sabbath, no manna will come down from the sky and that on the sixth day they must collect supplies for two days. The children of Israel continue from the desert of Sin and arrive at Rephidim. Once again there is no water and the Creator performs another miracle: Moses strikes a rock and water gushes out of it. Toward the arrival at Mount Sinai, Amalek appears and fights against Israel. When Moses raises his hands, Israel win; when he lowers them, Amalek wins. Finally, Israel defeat Amalek and the Creator tells Moses to write in a book of remembrance that the memory of Amalek must be blotted out from under the heaven.